The only other place I’ve ever seen a skinny cow was at the grocery store and it was quite a while ago, in the frozen dessert aisle. I’ve never tasted Skinny Cow ice cream but I hope it does taste good. Imagine my surprise earlier this week when I spotted the official Skinny Cow pinup girl not inside a grocery store, but outside of it. Here she is, on the side and on the back of a large delivery truck. Wow, I’m not sure I’d like to be driving right behind or next to this Skinny Cow truck. That image might be a little too disturbing distracting. 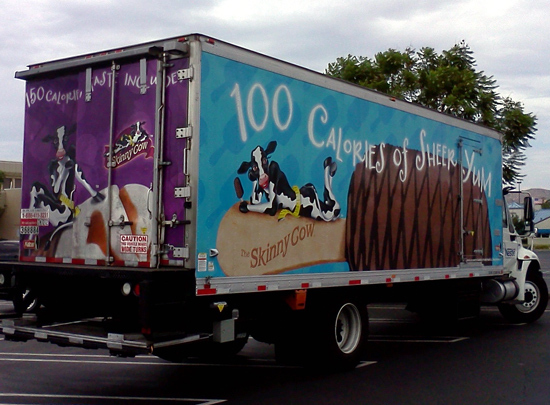 Have you ever spotted the Skinny Cow truck on the road before? If so, how did you react? Previous Post It’s a cow Halloween costume for… dogs?